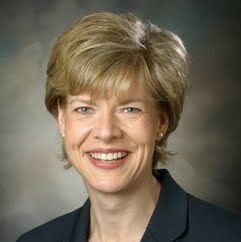 Tammy Suzanne Green Baldwin is the junior United States Senator from Wisconsin and a member of the Democratic Party. She previously served as the U.S. Representative from Wisconsin's 2nd congressional district from 1999 to 2013, as well as serving three terms in the Wisconsin Assembly representing the 78th district. Baldwin defeated her Republican opponent, former Wisconsin governor Tommy Thompson, in the 2012 U.S. Senate election. She is the first woman elected to represent Wisconsin in the Senate and the first openly gay U.S. Senator in history. As of 2012, Baldwin's voting record makes her one of the most liberal members of Congress.